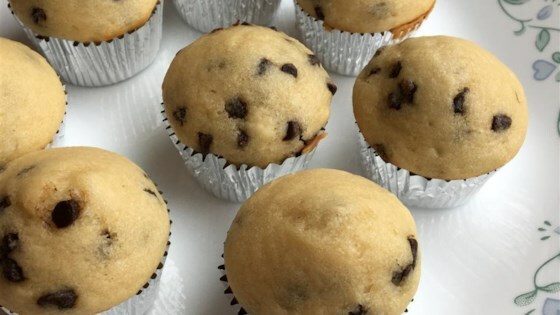 "My kids love when I make these yummy muffins. After trial and error of several muffin recipes, I've come up with what I think is my favorite one. Enjoy!" Preheat oven to 400 degrees F (200 degrees C). Lightly spray 48 miniature muffin cups. You can use regular chocolate chips, but they have a tendency to drop to the bottom of the cups so you will need to decrease amount of milk. I followed the recipe, made it in a baby cake maker one batch takes seven minutes. My dad and brother loved them. I am eleven it was easy. So simple and easy to make. I make a batch of these and freeze them as a snack for my daughter at school. Holy cow these were good I thought I'd be horrible sense I'm young and a kid but I was wrong they were so easy my family loved them and wouldn't stop eating them they were amazing!! !